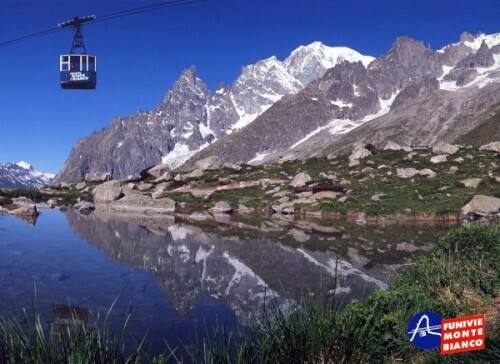 The Funivie Monte Bianco cableways offer everyone the opportunity to climb to the heart of the Mont Blanc Massif (an experience that is described as the Eighth Wonder of the World). On some days, the sky is so clear that the peak seems to be just an arm’s length away. The scenery is absolutely majestic. Climbing from Courmayeur up to the 3,462 metres of Pointe Helbronner is a true guided tour through one of the most amazing and breathtaking natural landscapes in the world. The unforgettable thrill of a tour to the heart of the Mont Blanc Massif: an aerial excursion offering visitors breathtaking landscapes. Pointe Helbronner is where the magnificent Glaciers Terrace is located, offering a 360° view of the whole alpine landscape: from the peak of the Mont Blanc, which dominates the surrounding area with its 4807 metres, to the Dent du Géant. The landscape spans ravines and granite towers in pastel hues. The horizon is marked by Europe’s famous “4000” peaks: Matterhorn, Monte Rosa and the Gran Paradiso. 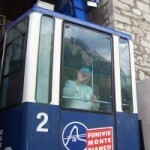 The transport service between Courmayeur – La Palud and Pointe Helbronner, in the heart of the Mont Blanc Massif, is currently provided by three twin-cable bi-directional cableway segments. The first two cableway segments were designed in the late thirties and erected in the following decade. After a series of setbacks during the war, when the facilities were the target of military attacks that slowed the construction process, their first trial run was conducted in 1947. The third segment was erected in the fifties, to serve as an international connection. It was inaugurated in 1957 and connects with the French border. In their present condition, the Funivie Monte Bianco facilities have undergone extensive and periodic maintenance, which has improved their overall efficiency. The new, large-scale project, which required an investment of 110 million euro over five years of work, involves completely reconstructing the three segments, starting from Pontal d’Entrèves, in a much more accessible area near the motorway and with ample underground parking. The new intermediate station will be moved to the left of the current one if facing the up-going line from the valley, while at Pointe Helbronner the new buildings will completely replace the old ones at the same location. 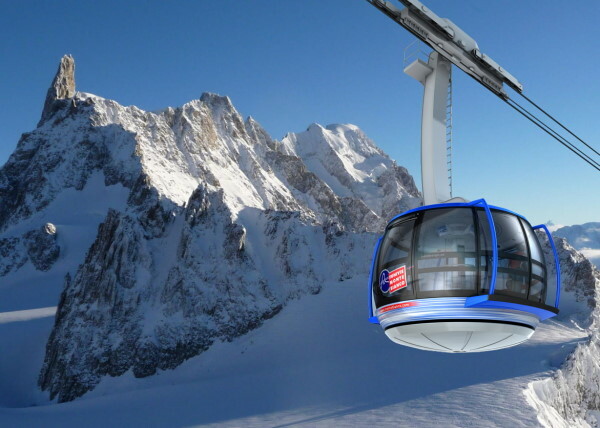 The new facilities will have a much higher carrying capacity, thus eliminating the long lines that can often go on for hours, and, thanks to improved comfort, will provide for a much more pleasant transport experience to Europe’s highest peak. For more in-depth technical details we invite you to explore the pertinent sections of this site.